Modern style meets with traditional ceremony in this religious chocolate bar wrapper design. Design: Simple lines and monochromatic polka dot cross. 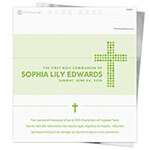 Personalization: Name, event and date on the front, message on the back.